Pics and Kicks: You Need Something Original. Check out these awesome designs by Matt. . . as in Heather's Matt . . . as in Heather of my favorite blog The Coterie. I can so see one of these hanging above my toity. . . If you would like to purchase one, in any color your little heart desires, shoot an e-mail to heathermildenstein@gmail.com. 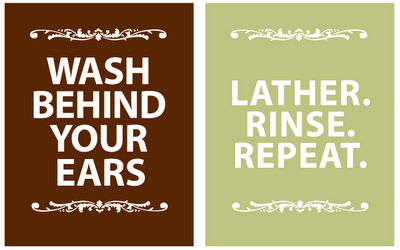 Wash Behind Your Ears or Lather. Rinse. Repeat. I'm so going deep brown. And don't forget your name and shipping address. HEYYY!!! You're so totally welcome! So cute. I want one.